Buy 3 or more get 5% off; or buy 5 of this product and get 6th btl FREE! 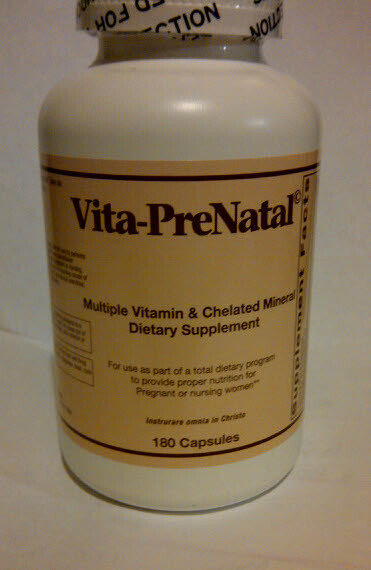 Vita Prenatal Fmla Capsules 180s [compare to Prof. Prenatal Formula]..same formula, better value! Special buy for a limited time! The quintessential high potency vitamin, mineral and micronutrient formulation for pregnant or breastfeeding moms, as discussed in Marilyn Shannon's "Fertility, Cycles and Nutrition" (available from www.ccli.org). Shannon was instrumental in the formulation of this product which replaced the Magnatal formula. A recent study suggests prenatal vitamins decrease the risk of autism. The dose on ALL of these products due to the high therapeutic levels of vitamins and nutrients, is SIX (6) tablets/capsules per day in divided doses, as they are NOT time-released products. We suggest a practical way is to take two (2) with each meal, three (3) times a day for a total of 6 tablets/capsules. This is the same formula as the tablet, just in capsule dosage form (it is actually a larger object than the tablet form!). Dosage is recommended as 6/day [2 capsules 3 times daily with or without meals]. Our private label formulation of the currently unavailable LifeTime Prof. Prenatal Formula CAPSULES. The Fish Oil in our Vita-Prenatal capsules comes from one or more of the following: Largemouth Bass, Shark, Swordfish, and King Mackerel. Great care is taken by our manufacturer to avoid fish species containing the toxin mercury or other contaminants such as Chlordane, PBCs or dioxin. The manufacturer, assures us and the public, the fish sources of their fish oil contains negligible (IF any) levels of mercury under current FDA recommendations. Most fish oils are mercury-free since mercury accumulates in the meat not the oils. Having had a safety record of 23+ years with this product, we are confident it is safe when used as directed. Vita-Prenatal Formula does not contain: sugar, gluten, soy, corn, milk, egg, starch, artificial coloring, artificial flavoring or preservatives, per the manufacturer. Formula matches that of LifeTime's Professional Prenatal Formula CAPSULES...same dosage at a much BETTER price!